Biographies are interesting. I figure the author most likely likes the subject, or why write about it? However, lately it seems the same few people are being written: Lincoln, Hamilton, Sonia Sotomayor and Amelia Earhart. Now, this is great. I enjoy learning about them as much as the next person. But how many times can you read about them? Therefore, when someone not as popular or new comes along, I am on it. The Diamond and the Boy: The Creation of Diamonds & The Life of H. Tracy Hall by Hannah Holt (delightfully illustrated by Jay Fleck) and The Golden Thread: A Song for Pete Seeger by Colin Meloy (with some far-out art by Nikki McClure) are two picture books about someone some may know (Seeger) and probably someone you have never heard of (Hall). Both are longer picture books not meant for the very young. I would not go much younger than 6 or 7 and you could go up to a young 9 or 10. Due to the picture book format, the older child might not be as into it, but the concepts are higher. 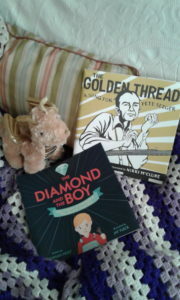 The Diamond and the Boy is a more traditional story biography. You get the facts of Hall’s life (bullied, born into poverty, working at an early age, intelligent, a lot of reading) but in a story format. And at the same time, you learn how the gem the diamond is made. On alternating pages, you see the time and effort that goes into natures creating a diamond and how Hall struggled to finally go to college and then create a process in the 1950’s to make man-made diamonds. His granddaughter, Holt, deliberately makes the connection of how hard it is to make a diamond, how hard diamonds are and how hard it was for Hall to make his way in the world. The end has a wonderful brief history of not only Hall’s highlights, but the diamond in history. They do not shy away from the Blood Diamonds history but done tastefully. Fleck’s illustrations are bright, detailed, realistic in an animated way. This book needs to be read twice: once for the text and a second time to capture all the details of the art. With The Golden Thread you get a less traditional biography. The facts are there (growing up in a musical family, military service, marriage, political, environmental and social advocacy) but done in a poetic fashion. The adult might feel they are reading a Seeger song. Text flows along the page on the main color of the book: the golden thread. His works, life and the history of the nation are all melded together in a tuneful story. Due to the black paper that was cut with an X-Acto knife you get a “burned block look” to the artwork. This can make it hard to read the text. And the fact there is a lot of details in the art creates a format where everything becomes blended together. The mainly gold and brown colors make it sometimes hard to distinguish text from art. This is not to say that it is a bad book, just one that takes time. The over-sized book also makes it somewhat non-traditional. There is also a brief history at the end of the book hitting the highlights of Meloy and McClure’s book. The fact both these men were born in 1919 amazes me. Two similar backgrounds but two very different paths were taken. But both were very influential in making the world as we know it today. Share the post "Don’t fret these books are a couple of gems"